In a complete change of plans from less than three weeks ago, NASA has asked Orbital ATK to switch rockets and launch the firms next Cygnus commercial cargo freighter to the space station on the tried and true Atlas V rather than their own Antares rocket – which just successfully delivered another Cygnus to the orbiting outpost with a hefty stash of science and supplies. The altered schedule “provides margin flexibility for the entire Antares workforce” Orbital ATK noted in a statement to Universe Today. However, the change of events comes as something of a surprise following the spectacularly successful nighttime blastoff of Antares on Oct. 17 with the Cygnus OA-5 resupply ship from the Mid-Atlantic Regional Spaceport at NASA’s Wallops Flight Facility on Virginia’s picturesque Eastern shore – as I reported on from onsite. At the time, Orbital ATK officials told Universe Today they were working towards efforts for the next Cygnus to launch from Wallops on the OA-7 resupply mission sometime next spring – tentatively in March 2017. “Following a successful Antares launch for the recent OA-5 Commercial Resupply Services mission and subsequent rendezvous and berthing of the Cygnus spacecraft with the International Space Station, Orbital ATK has responded to NASA’s needs for enhanced schedule assurance for cargo deliveries and maximum capacity of critical supplies to the space station in 2017 by once again partnering with United Launch Alliance to launch Cygnus aboard an Atlas V for the upcoming OA-7 mission in the spring timeframe,” Orbital ATK said in a statement to Universe Today. “We anticipate the earliest we may need a NASA commercial resupply mission is early 2017. 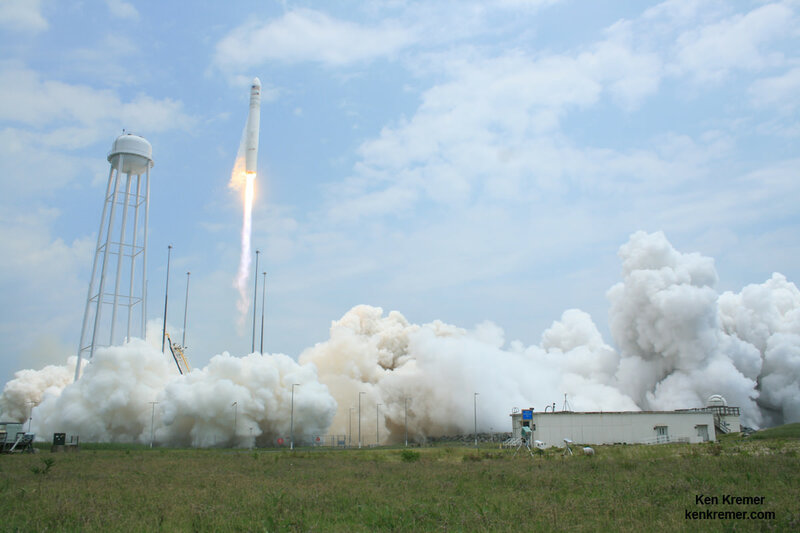 We mutually agreed with Orbital ATK to use an Atlas V for the company’s seventh contracted cargo resupply mission to the space station in the spring. 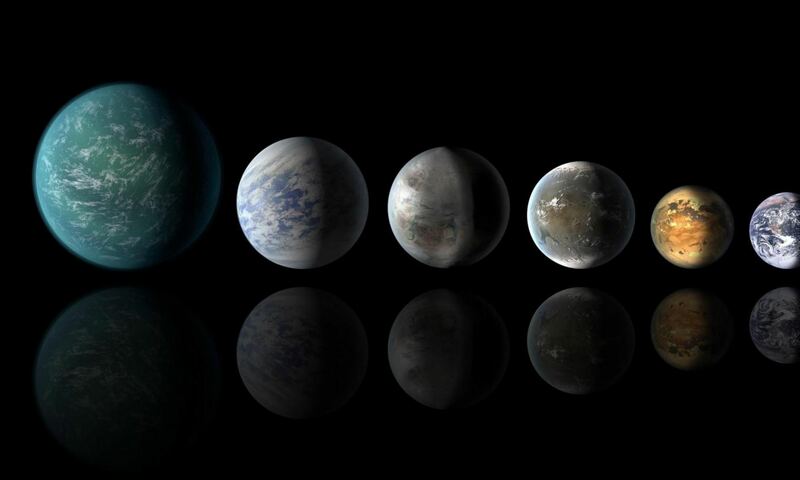 We will provide additional details at a later date,” NASA HQ public affairs told Universe Today for this story. The ULA Atlas V would launch from Space Launch Complex-41 on Cape Canaveral Air Force Station. Cygnus OA-7 will be processed and loaded at NASA’s Kennedy Space Center in Florida for later integration with the Atlas V.
When Cygnus launches on Atlas from KSC it can carry roughly over 300 pounds more to orbit vs. using Antares from Virginia. The Cygnus OA-5 spaceship is currently still berthed at the million pound station and carried about 5100 pounds to orbit. Thus the ISS is in good shape overall at this time from a supplies standpoint. “Supplies and research investigations are at good levels aboard the International Space Station. In addition to Orbital ATK’s recent successful commercial resupply services mission to station in October, a Russian Progress and Japanese HTV will carry additional cargo to the orbiting laboratory before the end of the year,” NASA public affairs elaborated for this story. Last month’s ‘Return to Flight’ liftoff of the upgraded Antares took place two years after its catastrophic failure moments after launch on October 28, 2014 with another Cygnus cargo ship bound for the International Space Station (ISS) that was destroyed along with all its precious contents. And that may be the rub, along with the fact that launches by NASA’s other Commercial Resupply Services (CRS) provider – namely SpaceX – are on hold due to the catastrophic launch pad failure on Sept. 1. Thus it’s not clear at this time when SpaceX can resume launching their Dragon cargo ships to the ISS. NASA must have a robust and steady train of cargo ships flying to the ISS to keep it fully operational and stocked with research and provisions for the international crews to maximize the stations science output. “NASA is continuously working with all our partners on range availability, space station traffic and other factors to ensure we operate station in a safe and effective way as we use it for preparing for longer duration missions farther into the solar system,” NASA PAO told me. The Atlas V built by competitor United Launch Alliance (ULA) enjoys a 100% record of launch success and was recently employed by Orbital ATK to launch a pair of Cygnus vessels to the International Space Station in the past year – in Dec. 2015 on the OA-4 mission and March 2016 on the OA-6 mission. Orbital ATK contracted ULA to launch Cygnus spacecraft to the ISS as an interim measure to fulfill their obligations to NASA to keep the station fully operational. Orbital ATK Vice President Frank Culbertson had previously told me that Orbital ATK could readily launch future Cygnus spaceships on the ULA Atlas V again, if the need arose. Seeking some near term launch stability NASA has apparently decided that that need has now arisen. Both Atlas/Cygnus cargo missions went off without a hitch and provide a ready and working template for the upcoming OA-7 cargo ship to be processed again at KSC and launched from Cape Canaveral in the spring of 2017. Orbital ATK says that follow on Cygnus craft will again return to the Antares rocket for Virginia launches later in 2017. Altogether a trio of Cygnus vessels might launch in 2017. “The company will be ready to support three cargo resupply missions to the station next year, and will work with NASA to finalize the flight schedule,” the company said. Cygnus was designed from the start to launch on a variety of launch vehicles – in addition to Antares. It is not clear at this time who will shoulder the added cost of launching Cygnus OA-7 on Atlas instead of Antares. Watch for Ken’s Antares/Atlas/Cygnus mission and launch reporting. He was reporting from on site at NASA’s Wallops Flight Facility, VA during the OA-5 launch campaign and previously from KSC for the OA-4 and OA-6 liftoffs. After a two year gap, the first Cygnus cargo freight train from Virginia bound for the International Space Station (ISS) arrived earlier this morning – restoring this critical supply route to full operation today, Sunday, Oct. 23. The Orbital ATK Cygnus cargo spacecraft packed with over 2.5 tons of supplies was berthed to an Earth-facing port on the Unity module of the ISS at 10:53 a.m. EDT. The Cygnus OA-5 mission took flight atop the first re-engined Orbital ATK Antares rocket during a spectacular Monday night liftoff on Oct. 17 at 7:40 p.m. EDT from the Mid-Atlantic Regional Spaceport pad 0A at NASA’s Wallops Flight Facility on Virginia’s picturesque Eastern shore. Antares pair of RD-181 first stage engines were firing with some 1.2 million pounds of liftoff thrust and brilliantly lighting up the crystal clear evening skies in every direction to the delight of hordes of spectators gathered from near and far. Cygnus is loaded with over 5,100 pounds of science investigations, food, supplies and hardware for the space station and its six-person multinational crew. 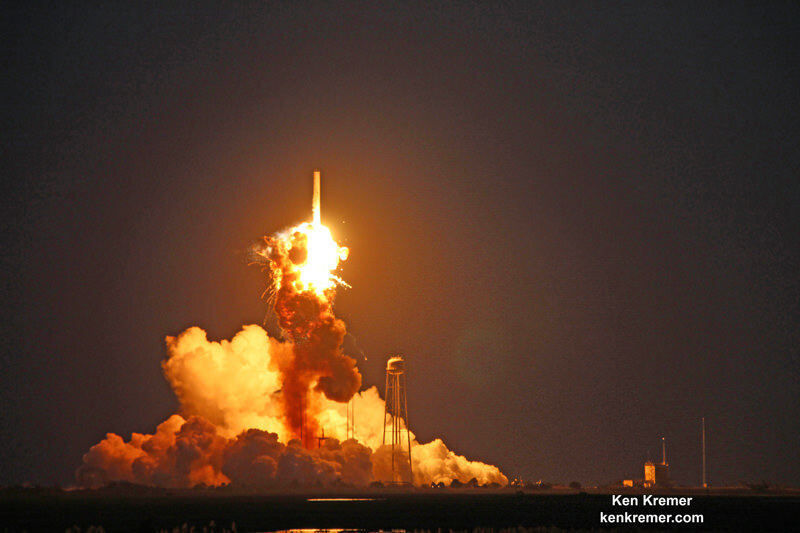 This was the first Antares launch from Virginia in two years following the rockets catastrophic failure just moments after liftoff on Oct. 28, 2014, which doomed the Orb-3 resupply mission to the space station – as witnessed by this author. Orbital ATK’s Antares commercial rocket had to be overhauled with the completely new RD-181 first stage engines- fueled by LOX/kerosene – following the destruction of the Antares rocket and Cygnus supply ship two years ago. The 14 story tall commercial Antares rocket launched for the first time in the upgraded 230 configuration – powered by a pair of the new Russian-built RD-181 first stage engines. The RD-181 replaces the previously used AJ26 engines which failed shortly after the last liftoff on Oct. 28, 2014 and destroyed the rocket and Cygnus cargo freighter. The launch mishap was traced to a failure in the AJ26 first stage engine turbopump and forced Antares launches to immediately grind to a halt. After a carefully choreographed five day orbital chase, Cygnus approached the million pound orbiting outpost this morning. After it was within reach, Expedition 49 Flight Engineers Takuya Onishi of the Japan Aerospace Exploration Agency and Kate Rubins of NASA carefully maneuvered the station’s 57.7-foot (17.6-meter) Canadian-built robotic arm to reach out and capture the Cygnus OA-5 spacecraft at 7:28 a.m. EDT. It was approximately 30 feet (10 meters) away from the station as Onishi and Rubins grappled the resupply ship with the robotic arms snares. After leak checks, the next step is for the crew to open the hatches between the pressurized Cygnus and Unity and begin unloading the stash aboard. The 21-foot-long (6.4-meter) spacecraft is scheduled to spend about five weeks attached to the station. The crew will pack the ship with trash and no longer needed supplies and gear. It will be undocked in November and then conduct several science experiments, including the Saffire fire experiment and deploy cubesats. Thereafter it will be commanded to conduct the customary destructive re-entry in Earth’s atmosphere. Watch for Ken’s continuing Antares/Cygnus mission and launch reporting. He was reporting from on site at NASA’s Wallops Flight Facility, VA during the launch campaign. NASA WALLOPS FLIGHT FACILITY, VA – The ‘Return to Flight’ blastoff of Orbital ATK’s upgraded Antares rocket will have to wait one more day to come to fruition with a magnificent Monday night launch – after a technical scrub was called this afternoon, Oct. 16, at NASA’s Virginia launch base due to a faulty cable. The launch potentially offers a thrilling skyshow to millions of US East Coast spectators if all goes well. Despite picture perfect Fall weather, technical gremlins intervened to halt Sunday nights planned commercial cargo mission for NASA carrying 2.5 tons of science and supplies bound for the International Space Station (ISS). The launch of the Orbital ATK CRS-5 mission is now scheduled for October 17 at 7:40 p.m. EDT, from the Mid-Atlantic Regional Spaceport pad 0A at NASA’s Wallops Flight Facility on Virginia’s picturesque Eastern shore. You can watch the launch live on NASA TV as well as the agency’s website beginning at 6:30 p.m. EDT Oct 17. Mondays liftoff is slated to take place approximately 23 minutes earlier then Sunday’s hoped for time of 8:03 p.m. EDT in order to match the moment when the orbital plane of the station passes on NASA Wallops. The weather outlook on Monday remains extremely favorable with a 95 percent chance of acceptable conditions at launch time. A nearly full moon has risen over Antares the past few days at the launch pad. Announcement of the launch scrub of the mission – also known as OA-5 – came just as the six hour countdown was set to begin after engineers discovered the bad cable. “Today’s launch of Orbital ATK’s Antares rocket is postponed 24 hours due to a ground support equipment (GSE) cable that did not perform as expected during the pre-launch check out,” officials at NASA Wallops said. The faulty cable was a component of the rocket’s hold down system at the pad, Orbital ATK officials told Universe Today after the scrub was announced. Technicians have spares on hand and are working now to replace the cable in time to permit a Monday evening launch. Besides the cable the rocket is apparently in perfect shape. Antares launches have been on hold for two years after it was grounded following its catastrophic failure just moments after liftoff on Oct. 28, 2014 that doomed the Orb-3 resupply mission to the space station – as witnessed by this author. The 14 story tall commercial Antares rocket also will launch for the first time in the upgraded 230 configuration – powered by new Russian-built first stage engines designed and manufactured by Energomesh. The 133-foot-tall (40-meter) Antares was rolled out to pad 0A on Thursday, Oct. 13 – three days prior to Sunday’s intended launch date. It was raised to the vertical launch position on Friday. The first Antares rocket liftoff in nearly two years is now being targeted for Oct. 13 on what is sure to be a dazzling nighttime leap from NASA’s Virginia launch base – and potentially offering a thrilling skyshow to millions of US East Coast spectators, if all goes well. Top NASA and Orbital ATK managers formally approved the launch of the upgraded commercial Antares rocket for next Thursday evening, Oct. 13, on a cargo resupply mission to the International Space Station (ISS). The announcement follows on the heels of a successful joint pre-launch Flight Readiness Review (FRR). Blastoff of the Orbital ATK Antares rocket is slated for 9:13 p.m. EDT on Oct. 13 from the Mid-Atlantic Regional Spaceport pad 0A at NASA’s Wallops Flight Facility on Virginia’s picturesque Eastern shore. Antares will be rolled out to the pad 0A on Oct. 11 – two days prior to the anticipated launch date. Antares will carry the Orbital OA-5 Cygnus cargo freighter to orbit on a flight bound for the ISS and its multinational crew of astronauts and cosmonauts. If Cygnus launches as planned on Oct. 13, it is scheduled to arrive at the station on Sunday, Oct. 16. Astronauts will use the space station’s robotic arm to grapple Cygnus at approximately about 6:45 a.m. EDT and berth it to the bottom of the station’s Unity module. NASA TV will provide live coverage of the launch as well as the rendezvous and grappling activities. The 2 year lull in Antares launches followed the rockets immediate grounding after its catastrophic failure just moments after liftoff on Oct. 28, 2014 that doomed the Orb-3 resupply mission to the space station – as witnessed by this author. Orbital ATK’s Antares commercial rocket had to be overhauled with the completely new RD-181 first stage engines following the destruction of the Antares rocket and Cygnus supply ship two years ago. In light of the grounding of the SpaceX Falcon 9 and Dragon cargo flights following the catastrophic Sept.1 launch pad disaster, and the catastrophic Antares launch failure in Oct. 2014, this Orbital ATK mission becomes more critical than ever to keep that station stocked and fully operational for the resident crews with a reliable American supply train. They utilized the ULA Atlas V rocket to successfully deliver two Cygnus vessels to the ISS on the OA-4 flight in Dec 2015 and OA-6 flight in March 2016. The ‘Return to Flight’ launch of Orbital ATK’s re-engined Antares rocket on a cargo resupply launch for NASA bound for the space station has been postponed for at least another month into September due to the need for further analysis of the revamped booster and other factors. Today’s announcement by Orbital ATK of a launch delay to mid-September comes barely two weeks before the long hoped for liftoff – which had been scheduled for late afternoon on August 22 from Orbital ATK’s launch base on Virginia’s picturesque eastern shore. The Antares 230 medium-class commercial launch vehicle rocket has been upgraded with new first stage Russian-built RD-181 engines that must be fully validated before launching NASA’s precious cargo to the International Space Station (ISS). Almost simultaneously, the Japan Aerospace Exploration Agency (JAXA) decided to postpone the upcoming launch of their next HTV H-11 Transfer Vehicle “KOUNOTORI6” (HTV6) which had been slated for October 1 from the Tanegashima Space Center. JAXA said a leak was detected during pressure testing which must be fixed before any launch attempt. Antares could potentially take the launch slot vacated by JAXA. Orbital ATK cited multiple factors for the launch postponement from NASA’s Wallops Flight Facility in a short statement released today, August 10. “Due to a variety of interrelated factors, including the company’s continuing processing, inspection and testing of the flight vehicle at Wallops Island, and NASA’s scheduling of crew activities on the International Space Station in preparation for upcoming cargo and crew launches, Orbital ATK is currently working with NASA to target a window in the second half of September for the launch of the OA-5 mission,” Orbital ATK announced. 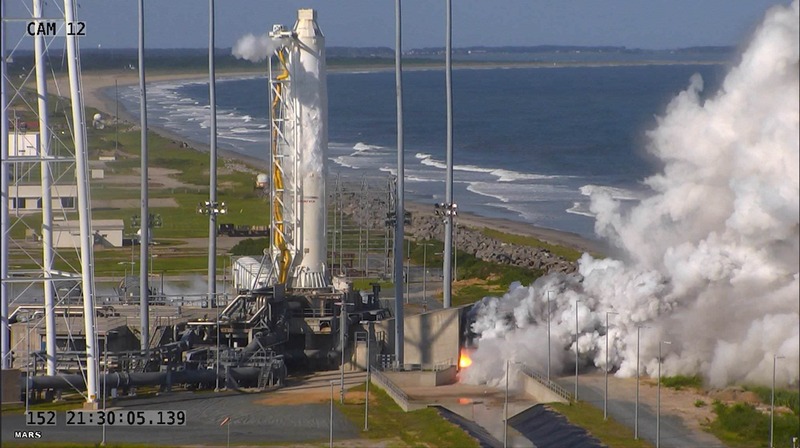 Also there are reports that the re-engined Antares experience some form of unexpected ‘vibrations’ during the recent static fire test conducted in May. 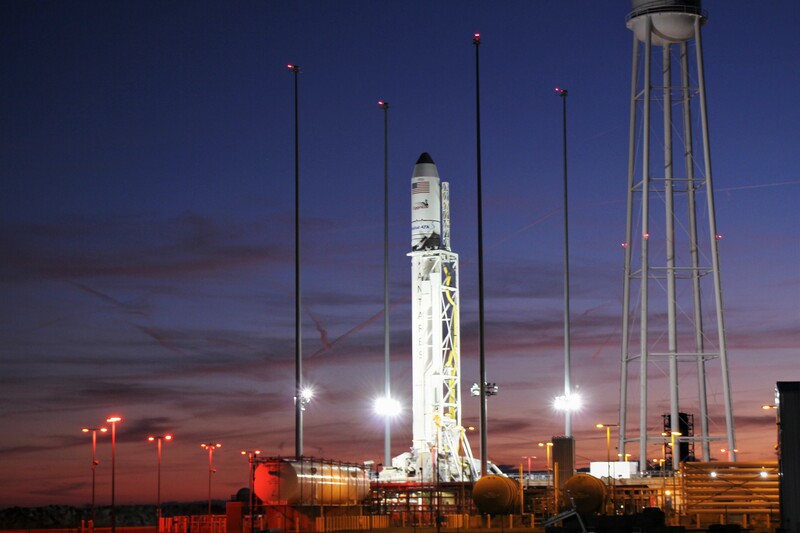 This is the latest in a string of Antares launch delays, running back to the start of 2016. Furthermore, a new launch date won’t be announced for at least several more weeks. “A more specific launch date will be identified in the coming weeks,” said Orbital ATK. Orbital ATK’s Antares commercial rocket had to be overhauled with completely new first stage engines following the catastrophic launch failure nearly two years ago on October 28, 2014 just seconds after blastoff that doomed the Orb-3 resupply mission to the space station. The goal of the Antares ‘Return to Flight’ mission is to launch Orbital ATK’s Cygnus cargo freighter on the OA-5 resupply mission for NASA to the International Space Station (ISS). To that end the aerospace firm recently completed a successful 30 second long test firing of the re-engined first stage on May 31 at Virginia Space’s Mid-Atlantic Regional Spaceport (MARS) Launch Pad 0A – as I reported here earlier. Teams from Orbital ATK and NASA have been scrutinizing the data in great detail ever since then to ensure the rocket is really ready before committing to the high stakes launch. “Orbital ATK completed a stage test at the end of May and final data review has confirmed the test was successful, clearing the way for the Antares return to flight,” said the company. Antares launches had immediately ground to a halt following the devastating launch failure 22 months ago which destroyed the rocket and its critical payload of space station science and supplies for NASA in a huge fireball just seconds after blastoff – as witnessed by this author. As a direct consequence of the catastrophic launch disaster, Orbital ATK managers decided to outfit the Antares medium-class rocket with new first stage RD-181 engines built in Russia. The RD-181 flight engines are built by Energomash in Russia and had to be successfully tested via the static hot fire test to ensure their readiness. Whenever it does fly on the OA-5 mission, Orbital ATK’s Cygnus cargo craft will be loaded with approximately 2,400 kg (5,290 lbs.) of supplies and science experiments for space station and its six person crews.